WASHINGTON, DC--(Marketwired - Jun 12, 2013) - Drs. 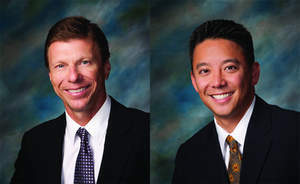 Thomas Clinch and Paul Kang, Washington, DC cataract surgeons, have adopted an innovative cataract surgery technique. Their private practice, Eye Doctors of Washington, recently acquired the LenSx® Femtosecond Laser that allows blade-free removal of cataracts with more precision than ever before. According to Drs. Clinch and Kang, untreated cataracts cause progressively impaired vision, eventually leading to blindness. The LenSx® Femtosecond Laser, developed by Alcon, has been recently approved by the FDA and successfully eliminates cataracts without the use of a surgical blade. The laser is the first to be used for cataract surgery, and Eye Doctors of Washington is one of the few ophthalmology facilities in the United States to offer this advanced form of cataract treatment. One major advancement the LenSx® Femtosecond Laser provides is image-guided computer precision to assist refractive cataract surgeons in the operating room. Using this technology, the treatment is customized for each patient, yielding an exceptionally high degree of surgical accuracy and results that are tailored to the patient's individual situation. Drs. Clinch and Kang are also among the first surgeons performing cataract surgery in Washington, DC and the surrounding area to use the LenSx® Femtosecond Laser with SoftFit™ Patient Interface. This new patient interface allows Drs. Clinch and Kang to improve surgical outcomes while enhancing patient comfort. The LenSx® SoftFit™ Patient Interface, which provides all the features of the LenSx® Laser single piece patient interface uses the natural curvature of the patient's cornea to secure a gentle fit to a patient's eye while minimizing corneal distortion. Drs. Clinch and Kang are proud to offer this advanced technology at Eye Doctors of Washington and to continue to offer their patients the highest quality of eye care available, whether they are performing cataract surgery or LASIK in Washington DC. Dr. Thomas Clinch is the first surgeon in the Washington, DC region to utilize the ReSTOR lens in cataract surgery, and the only eye surgeon in the area selected to participate in FDA trials for IOLs used to correct extreme nearsightedness. He has been selected to the "Top Doctor" list by the Washingtonian Magazine, as well as the "SuperDoctors" list by the Washington Post. Dr. Clinch is available for interview upon request. Dr. Paul Kang has been named to the "Top Doctor" list by Washingtonian Magazine, the "SuperDoctors" list by the Washington Post, and as one of America's Top Ophthalmologists. He is a scientific reviewer for the Journal of Cataract and Refractive Surgery. Dr. Kang is available for interview upon request.